School of Motoring Sign Lettering can be provided in any colour or type style, from simple graphics to computer generated images. We can even transform your existing sign! Before we produce a design, a draft of how your sign will look will be forwarded to you for approval. Lettering and graphics are easy to apply. 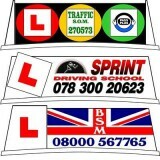 Update your School of Motoring (S.O.M.) sign with one of our full colour digitally produced image..